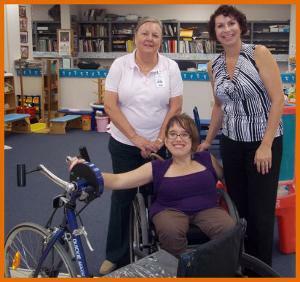 On May 16th, Simone Baldwin of Teachers Insurance Specialists along with her daughter, Amber Evans, made a special trip to the Physical Therapy Department at Lake Silver E. S. Lake Silver hosts a Physically Impaired program on their campus and Amber was a student in this program when she was 3 - 4 years old! Deciding that young children would benefit from this form of exercise while having fun, Amber donated her hand-propelled bike to the Physical Therapy Department! As an alumni, Amber enjoyed seeing where she attended school at such an early age & met a Physical Therapist who actually worked with her during that time! It is ironic that Teachers Insurance Specialists is now the assigned Horace Mann agency for Lake Silver E. S.!